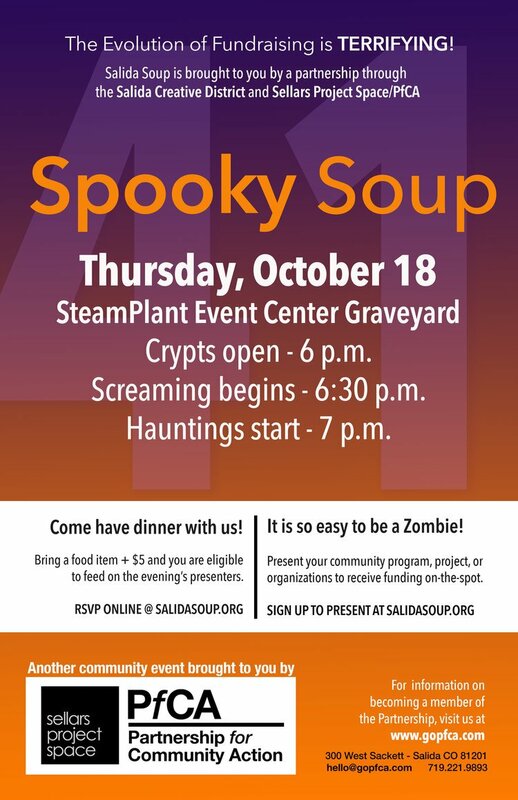 October’s Salida Soup will be held in the Ballroom from 6:00pm-8:00pm. Don’t miss it! Salida, located on the banks of the Arkansas River and with 12 nearby peaks over 14,000 feet in elevation, is known for its skiing, hiking, biking, whitewater rafting, kayaking, fly-fishing, camping, horseback riding, tennis and golf. The area was originally settled by the Ute Indians who favored the area’s natural hot springs. The City of Salida was founded by the Denver & Rio Grande railroads in 1880. The usual mix of industries: mining, quarrying, smelting, agriculture and retail trade—along with the usual “related” saloons, gambling and prostitution—existed at various times and magnitudes.